Laure Prouvost has released a limited edition tapestry ahead of the 58th International Art Exhibition of La Biennale di Venezia, 2019. Lisson Gallery is excited to share this unique opportunity to support Prouvost and her new body of work for the French Pavilion. 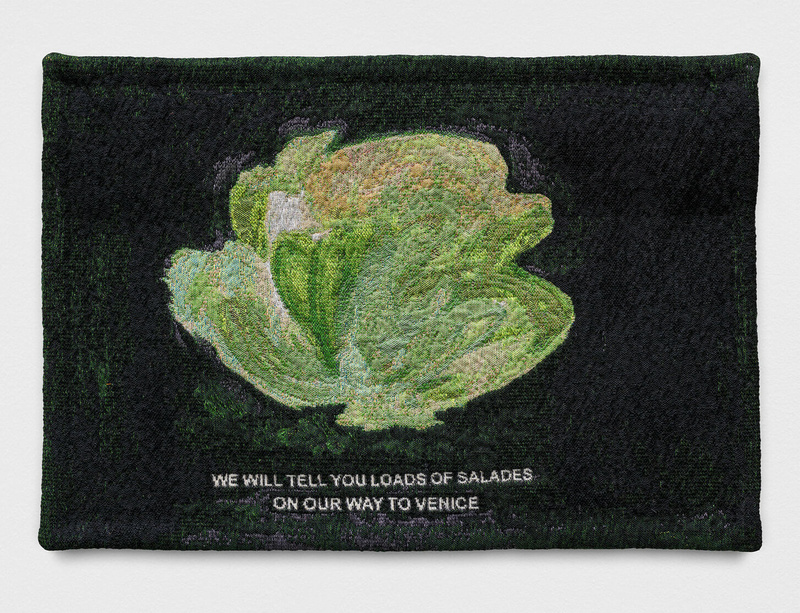 The tapestry, titled We will tell you loads of salads on our way to Venice, is a play on the popular French expression, “On va vous raconter des salades”. This phrase, a figure of speech meaning “to share extraordinary, unbelievable stories”, literally translates as “to tell salads”. Reflecting the renowned playfulness in Laure’s work, this tapestry also echoes her journey as she prepares to unveil her new exhibition for the French Pavilion in Venice. Produced in collaboration with a specialist atelier in Flanders, the tapestry is a limited edition of 100, and now available for pre-order. All funds will be directed into the production of Prouvost's new work.